Cacoxenite is a mineral first found in the Hrbek Mines of the Czech Republic. 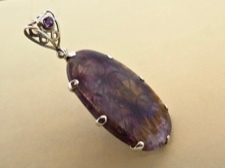 It manifests itself as striking inclusions within a host crystal, like Amethyst. 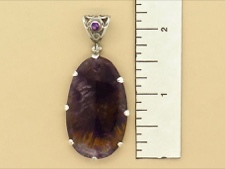 This pendant shows radiating striations of deep gold cacoxenite within a smooth amethyst oval. 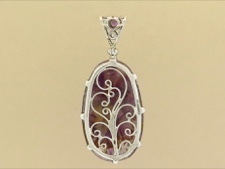 Prong set in sterling silver in a delicate swirl frame, this setting allows the brilliant inclusions to shine through. 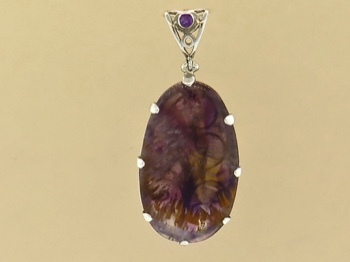 There is a tiny amethyst stone set in the bail. Please see below for a size reference.